The NEW BLACKSPOT ROAD ANGEL PROFESSIONAL (CONNECTED) is Blackspots' latest wireless Road Angel product giving you access the UK's No 1 safety camera and accident blackspot database and utilising up to the minute downloads via GPRS. 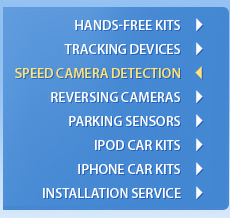 Utilising GPS (satellite) & GPRS technology, Road Angel Professional (Connected) alerts you to: accident blackspots and safety cameras (including Gatso,TruVelo, SPECS Watchman, Speedcurb, DS2) and also mobile cameras with an audible and visual alert - with no need to connect to a pc. Laser Star is the most advanced and cost effective Laser Diffusing/Parking sensor on the Market.